Kimberly Jones is a Division I assistant strength and conditioning coach. She programs speed, strength, agility, conditioning and nutritional regimen for her male and female athletes. Jones received a B.S. in psychology from Xavier University of Louisiana, and an M.A. in education from Loyola Marymount University. Golfer's elbow is a condition characterized by pain and tenderness on the inside or outside of the elbow. Medial epicondylitis is typically associated with golf, but many golfers also experience symptoms from lateral epicondylitis, or tennis elbow. These symptoms occur because of the overuse of the muscles involved in bending the fingers and wrist. 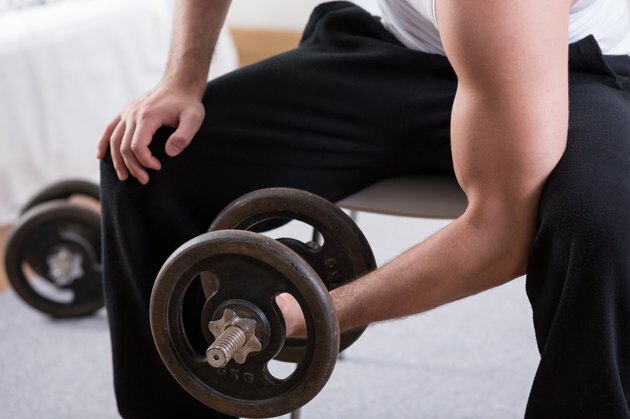 The National Strength and Conditioning Association states that at the initial sign of pain it is important to reduce activity, and implement stretching and rehabilitative weightlifting exercises to help improve your condition. The elbow is a joint at which the humerus, ulna and radius bones meet. Located at the bottom of the humerus are bony bumps called epicondyles. The medial epicondyle is located on the inner side of the elbow, while the lateral epicondyle is on the outside of the elbow. Muscles in the forearm used to flex and extend the wrist are connected to tendons attached to these areas. Overuse of these muscles can cause inflammation and tiny tears in the tendon at the epicondyle, resulting in pain surrounding the elbow. There are a number of symptoms associated with this condition. They can include pain that begins at the elbow and spreads to the forearm. Either the medial or lateral side of the elbow will be tender to touch. Movements involving the elbow will hurt, and according to the Titleist Performance Institute, the condition can even get worse if the hand is placed underneath the head while sleeping. If you have developed epicondylitis, remember the RICE protocol. Rest it, apply ice, compress the area with a bandage to prevent swelling and elevate the arm while sitting or lying down. Overuse and constant repetitive movements of the wrist flexors and extensors cause epicondylitis. After golf practice stretch muscles of the wrist and forearms in the opposite direction of which they are used during the swing. Weightlifting is also beneficial in preventing the onset of of this type of injury. Use light weights to strengthen the muscles that flex and extend the wrist as well. This will help combat any muscle imbalances in the forearm that can develop because of overuse. Hold a light dumbbell in your hand, with your elbow tucked toward your side at 90 degrees. Begin with the palm facing up and rotate your hand so the palm faces down. Repeat and perform three sets of 10 repetitions. The next exercise begins in the same position as the previous exercise, except the wrist is in a sideways position with the thumbs up. Hold a dumbbell and bend your wrist up with your thumb reaching toward the ceiling, and lower it back to the starting position. Do not move your forearm throughout this exercise. Do three sets of 10 repetitions. Sit down or kneel in front of a weight bench. Rest forearms on the bench with palms facing down and elbows bent, with only the wrists and hands hanging over the edge. Hold a light weight in the hand and slowly raise and lower the hand by bending wrist up and down. Do not lift the forearm off of the table. Do three sets of 10 repetitions. Next, perform this exercise with the palms facing up as well. Titleist Performance Institute: What is Tennis Elbow?